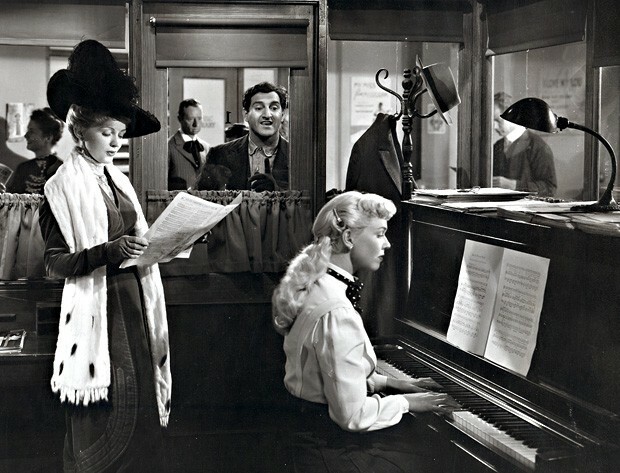 Doris Day and Danny Thomas in I’ll See You in My Dreams, 1951. The film depicted the career of Gus Kahn, lyricist of more than 300 songs, a number of which are now considered to be standards in American musical history. Thomas, then a popular nightclub and radio performer and occasional movie actor, portrayed Kahn. Day – who got top billing – portrayed Kahn’s wife, Grace. To contribute to the film’s accuracy, Warner Bros. used the real Grace Kahn as an advisor on the movie. 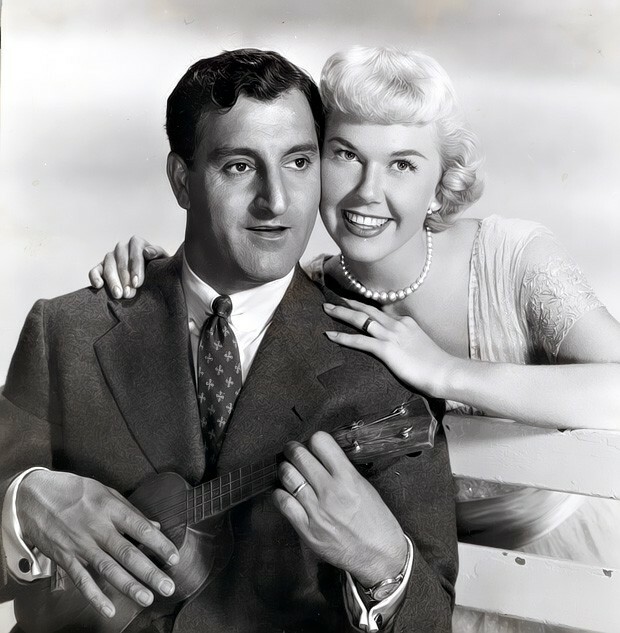 Danny Thomas as Gus Kahn and Doris Day as his wife Grace. This sweet film begins in Chicago, home of Rossiter music publishers, a purveyor of sheet music. Gus Kahn has written some lyrics and seeks an opinion about their merit from a Rossiter employee, music screener Grace LeBoy. Attracted to Gus and also recognizing his talent, Grace begins to collaborate with him by writing music for his lyrics. Finally achieving a published song, they quit their respective jobs in order to write more songs and to promote their work. After several years as business partners, Gus and Grace become husband and wife. By now, he has begun collaborating with well-known composers. They include Richard Whiting (Ain’t We Got Fun? ), Walter Donaldson (My Buddy, Makin’ Whoopee and Love Me or Leave Me), and Isham Jones (The One I Love Belongs to Somebody Else and It Had to Be You). The film’s title song is by Jones and Kahn. Besides being a music composer and mother of the two Kahn children, Grace is a tireless and effective song plugger of her husband’s work. Although she is the stronger and more proactive one of the couple, they are a good team and Gus has several hit songs during World War I. (One is Toot, Toot, Tootsie, which Day performs in black face.) Gus’s success leads him to Broadway and the Ziegfeld Follies, but the Kahns fall on hard times after the stock market crashes in 1929. Grace is a tireless and effective song plugger of her husband’s work. Needing work, Gus goes to Hollywood and tries to write for the movies. Taste in popular music has changed, though; it is now very different from the kind of lyric he likes to write. Unwilling to compromise, he suffers from discouragement and stress. Grace secretly intervenes to reunite him with composer Donaldson, with whom he begins to produce hit songs again. Now Gus is back in demand to write with other composers as well. The film ends with Donaldson arranging a surprise gala in Gus’s honor. Called on to speak, he acknowledges Grace as the guiding force behind his success. In a tearful finale, Thomas and Day sing a duet of the first song the Kahns wrote together, I Wish I Had a Girl. Danny Thomas and Doris Day. Thomas is excellent as Gus Kahn, playing the part with exactly the right tone. This is one of Day’s best roles; she is believable in every scene and, as usual, all of her vocal performances are great. The supporting cast members, including Frank Lovejoy, James Gleason, Jim Backus, Patrice Wymore, and Mary Wickes, are all fine. 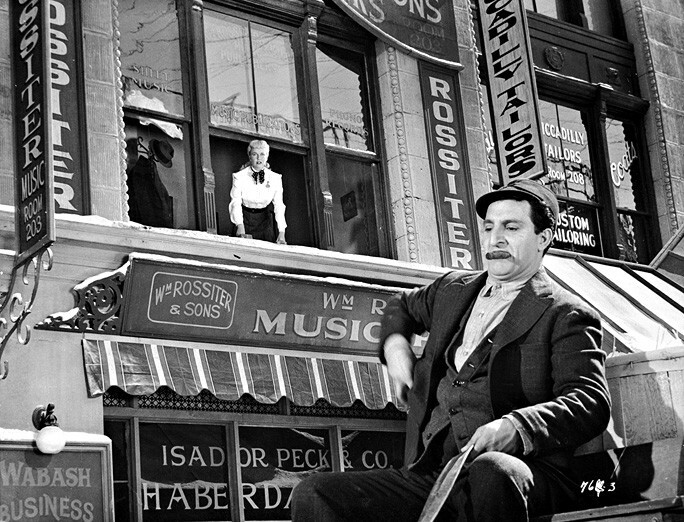 Musical numbers are well staged by LeRoy Prinz, and the screenplay by Melville Shavelson and Jack Rose won a Writers Guild nomination for them. The film received a Golden Globe nomination as best musical, and Michael Curtiz’s excellent direction brought him a best director nomination from the Directors Guild of America. 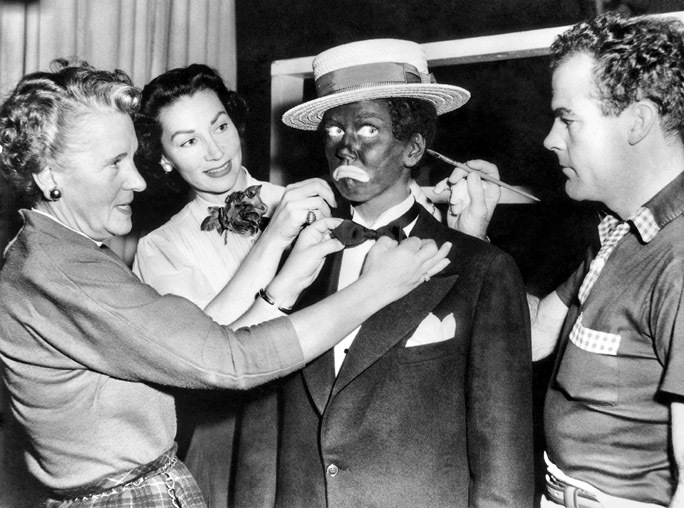 Doris Day frowns while a makeup man touches up the blackface makeup in I’ll See You in My Dreams. Grace Kahn (Doris Day) sticks by her husband as his Hollywood career thrives and along the way, she gets to perform a blackface minstrel routine to entertain the troops. “Warner Brothers couldn’t have given the exhibitors a better picture with which to start the New Year. From the point of view of the theater owner and the audience, I’ll See You in My Dreams should be top in screen entertainment, a delight to the eye and ear. This is the life story of Gus Kahn, the lyricist whose work delighted America for so many decades and who, in collaboration with the great popular composers of the era, turned out the multitude of songs that swept the nation and brought him fame. It is story tenderly told, beautifully acted and alive with catchy tunes. 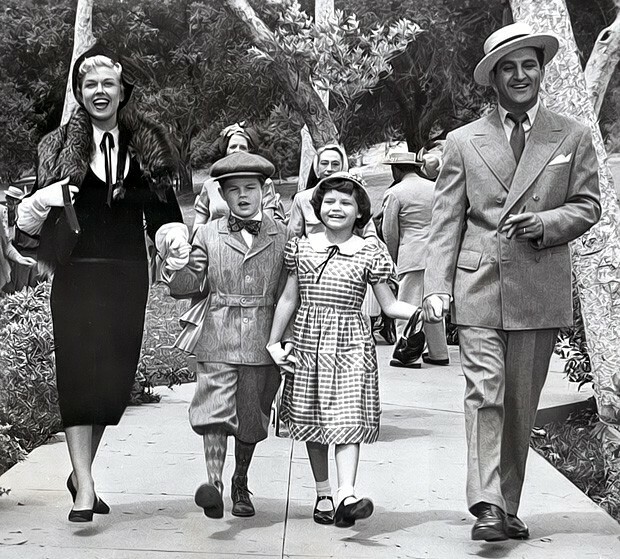 Gus and Grace Kahn with their two children. Maybe some of the critics will hedge over details. Some will call it slow and overly sentimental. Danny Thomas does a superb job as Gus Kahn, that straight-laced, bumbling gentleman who wrote lyrics on the back of envelopes while sitting with friends at the track. This should establish him as a solid star. 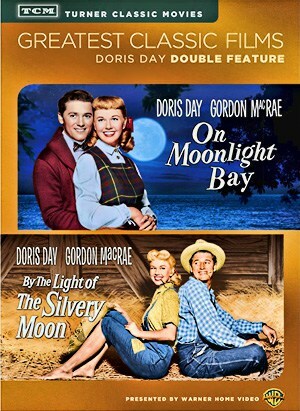 To support him, he has uniformly excellent cast, headed by Doris Day, who acts and sings to perfection.